It's time to say goodbye to August 2015 and to kick straight off with the weather, his was not a great version of August. We had a cloudy and wet start of the month with almost two weeks of rain and strong wind. The middle of the month was good again but towards the end we encountered more rain and a little bit of wind. Not your average August on Koh Samui and not anywhere near how last year's August was. Work wise it was a quiet month, I did log my 500th dive at Sail Rock though and took friends from the Netherlands on a PADI Discover Scuba Dive at Sail Rock. September is starting tomorrow and I'm looking forward to it. There will be the Kamalaya run come 13th September, you will be bound to see me there! The forecast for the next ten days predicts lots of cloudy days with an occasional tropical shower. The forecast predicts cloudy skies for the next ted days with occasionally some break in the cloud cover and the possibility of a tropical shower. The forecast predicts a cloudy week all of next week with some sun coming through again after next weekend. There should be hardly any wind and you may possibly encounter a fairly rare tropical shower. The forecast predicts mainly cloudy skies for the next ten days with an occasional tropical shower and the wind is almost gone. The forecast for the next ten days shows that the wind has gone but we will have mostly cloudy skies with an option for a tropical shower during most days. The forecast predicts sunnier skies until the weekend and after the weekend it may clam up with plenty of clouds. For Friday a shower is possible. The forecast predicts fairly cloudy skies for the next ten days with occasional blue spots and sunny skies. The forecast shows part;y cloudy skies for the next ten days with plenty of sunny moments. Tomorrow we may have a bit of stronger wind. Yesterday saw the 10th Anniversary of Sabeinglae restaurant in Lamai and due to family connections, we were invited. 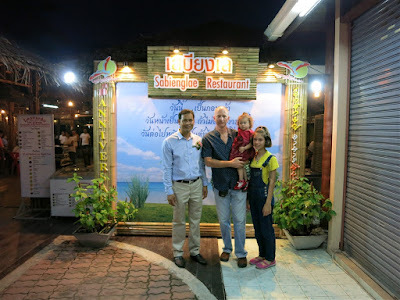 The owner, Khun Amnath Chotchuang ahs the same family name as my wife, and just like her dad, he originates from Koh Phangan. Each year my father in law receives an invitation for the annual anniversary of the restaurant and this year he passed the honors on to us, to which we happily obliged. Within one week, we visited now twice! Earlier this week we took old friends from the Netherlands to Sabeinglae, which they thought was their best meal with Thai food whilst in the kingdom. It was very busy and cars were parked all over the place, I found a parking spot some 100 meters away from the entrance. 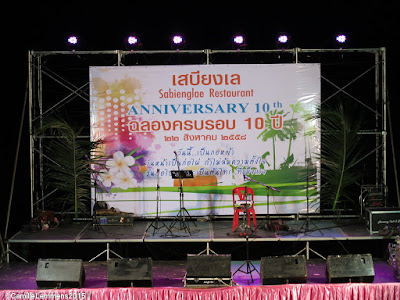 A couple of traffic controllers were put in place for the occasion, so the Samui hi so could accident free get in and out of their cars. It was indeed a meeting of Samui's hi so, politicians and family. 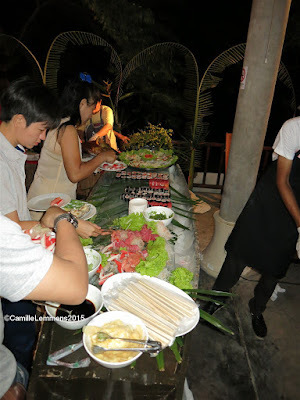 I only spotted two other Westerners and doubt that many other non Thais were present. 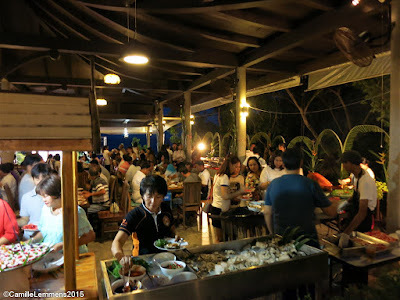 The restaurant was packed for the occasion and tables were even out on the beach in order to accommodate all attendees. With three locations on the island, in Lamai, Chaweng and Fisherman's Village, they're going strong. 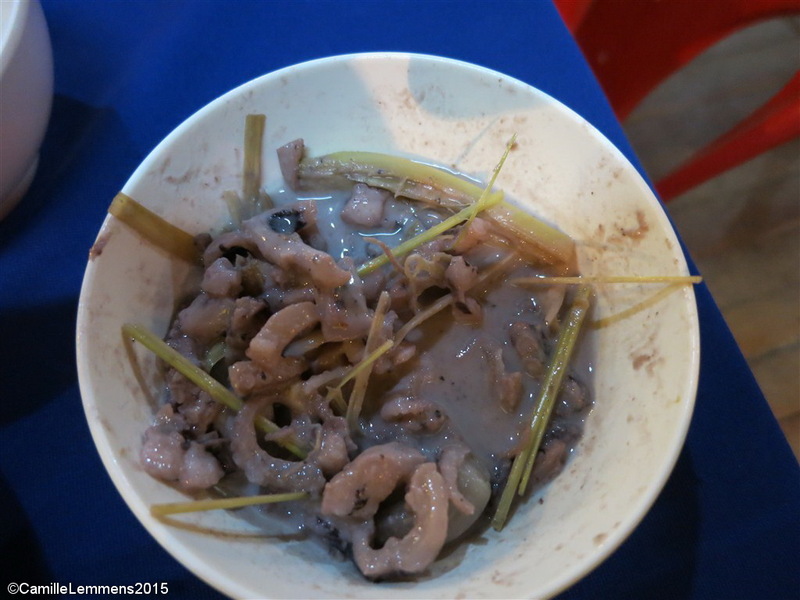 The Lamai location is still our favorite with the restaurant in Fisherman's Village coming in at a very close second. 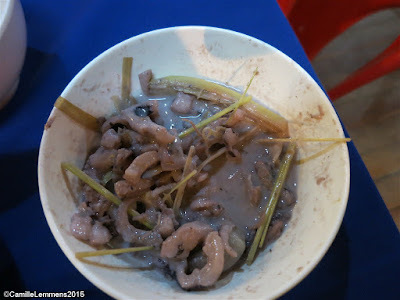 We enjoyed our food, with waai kuaw (pictured above), nice prawns, crispy pork, various curries, hor mok plaa (steamed fish with curry in banana leaves), sushi and various other options on offer. Well worth the long drive down there from where we live! A whole crispy suckling pig, loosing it's shape when the evening progressed. Very tasty! We were glad that we had the opportunity to visit and enjoyed it. We can highly recommend a visit to either one of the three locations on the island. Do your research so you know what to order, they're worth trying something out you may not know! Due to our participation in the 8th Cancer care run in Nathon earlier during the morning of the same day, we didn't stay too long and went home relatively early, satisfied and with a full stomach. We slept great yesterday! The forecast is looking good for the ten days, there may be a bit more sunshine than previously predicted and chances of getting a tropical shower have also diminished. After a very early wake up call, it was time to gather the family and head off for the 8th Cancer Care run in Nathon, race day time! This was the 5th time I participated in this event and by now I know that they always run out of T-shirts, so I made a phone reservation and sure enough, the ordered tees where at the pick up area. Nice one! This year I didn't see a lot of promotion being made for the race and it kind of showed at the gathering point, there seemed to be less people compared to other years. From the three race distances on offer, 3-, 5- and 10km, I choose the 10km distance and there were about 35-40 participants in this category. Registration was scheduled for 6am and that worked fine, but as with so many small running events around Thailand, the scheduled start of the race was missed by a full 20 minutes. If you want to start a race, it's rather annoying that you always have to wait around. However, by 7.20am we were on our way and it was busy at the start, with the 5 and 10km runners starting in the same group. It was a lot nice to race after the 5km had reached their turn around point and the field thinned out drastically! The road was well marked and there were plenty of water stations. Under a cloudy sky, we had very agreeable running temperatures. The lucky draw and our son Dennis won a meal for two at the Four Seasons Resort! My overall time was 50'08 minutes, which yielded an average pace of 5'01 per km and the total distance according to my running watch was 9.96km. A good time that I'm happy with, considering that I just took a 6 week injury due break and started two weeks ago with training. Earlier this year I had better race times, but training is on track and I hope to be able to beat my times I ran earlier this year. I also stopped for times during the race to pick up some coins, in total I found 9.-THB on the race route, which probably makes me the highest earner during today's race, but it's still not enough to make a career out of my running! 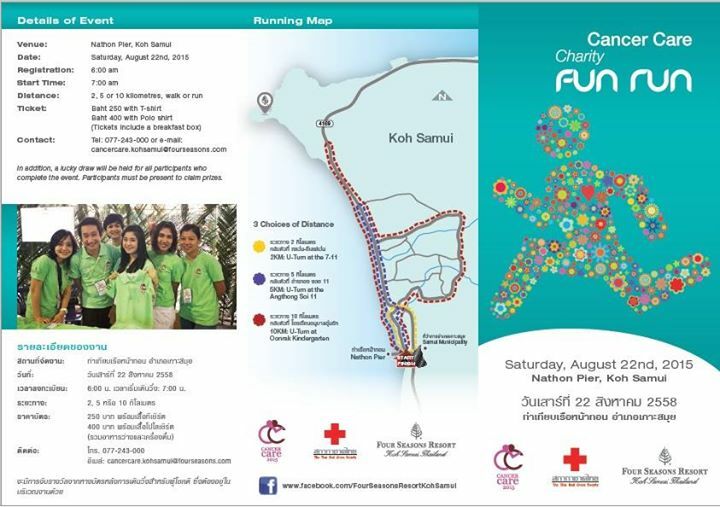 The next running event on Koh Samui will be the Kamalaya Charity run, Sunday 13th September at the Namuang Stadium! See you there! The forecast predicts fairly cloudy skies for the next ten days with an occasional shower but the strong winds seem to have gone off the prediction charts now. The forecast shows cloud cover for the next ten days with showers possible after this weekend and around the next weekend. Early next month the Samui Beach Volleyball, 3-6 September 2015 on Chaweng Beach is coming up with some serious price money involved, worth over 200,000.-THB. There will be competition for students (under 14 years old) and amateurs (over 14 years old) and the tournament is set up with a knock out system. Signing up your team can be done until 31st August at the Bangkok Air website, click on this link. Here you will also find a schedule, price money, rules an d how to sign up. 1. Wednesday 2 September 2015 Team matching From 14.00 hrs. onwards. 2. Thursday 3 September 2015 First round From 9.00 hrs. onwards. 3. Friday 4 September 2015 Second round From 9.00 hrs. onwards. 4. Saturday 5 September 2015 Third round From 9.00 hrs. onwards. 5. Sunday 6 September 2015 Semi-final round From 9.00 hrs. onwards. Final round From 13.00 hrs. onwards. Looks like it will be a great event and I hope they will have plenty of visitors, fans and supporters! The forecast predicts that the strong wind is going to stay for the next ten days with regular tropical showers being a daily possibility. The forecast predicts the wind to pick up tomorrow with next week Thursday having possibly storm like conditions, including plenty of rain. The forecast predicts the wind to pick up by tomorrow afternoon, which will bring cloudy skies, an occasional shower and plenty of rain as of next Tuesday. The forecast remains looking good, Wednesday the wind should pick up and from this coming Sunday onward we may have rain for a couple of days. The forecast is looking good for the next ten days, mostly fairly sunny to sunny with the wind picking up come Wednesday and there's a slim chance of a tropical shower. The forecast predicts mostly sunny skies for the ten days with the wind picking up come Wednesday. There's a very slim chance of a tropical shower. Next weekend it's show time again with Saturday 22nd August, 8th Cancer Care charity run in Nathon, organized by the Four Seasons Resort Koh Samui. You can choose from a 3km fun run or a 10km run. Registration starts at 6am on Saturday morning, come 22nd August, near the Nathon Seatran pier. Strat of the race is at 7am. Registration fee is 250,-THB with a t-shirt and 400.-THB with a polo shirt. Tickets also include a breakfast box and each participant can get lucky with a lucky draw during which you can win stays at various Four Season resorts and Bangkok Air tickets. It seems that the route has been changed and we're back to running the less exciting way towards Baan Namuang, with the 10km turning point being at the Honda dealership. It's a great event and the Cancer Care race has it's origins in Terry Fox's run across Canada in 1980 with the marathon of hope. I'm hoping to see as many people as possible participating in this event! See you in Nathon. The forecast predicts mostly dry days except an occasional tropical shower for the next ten days with the wind picking up next Wednesday. Yes indeed, a new page has been created on this blog about tour bookings and I hope you visit this page a lot and book tour through this page. Visit the page by clicking here. Many times I'm being asked what can we do on Koh Samui and hopefully this page will help you a little bit on finding the right tour activity for you on Koh Samui. At the moment three tours have been selected and all three of them have been tested by me and all three passed this test. I work with reliable people that I know and offer quality tours. There's a permanent link to this new page on top of each blog post, have a look and click on the link (the orange colored words). All three tours currently on offer insurance and cater to different activities. One nice feature is that they are half day trips, which leaves enough time to do other things that same day. 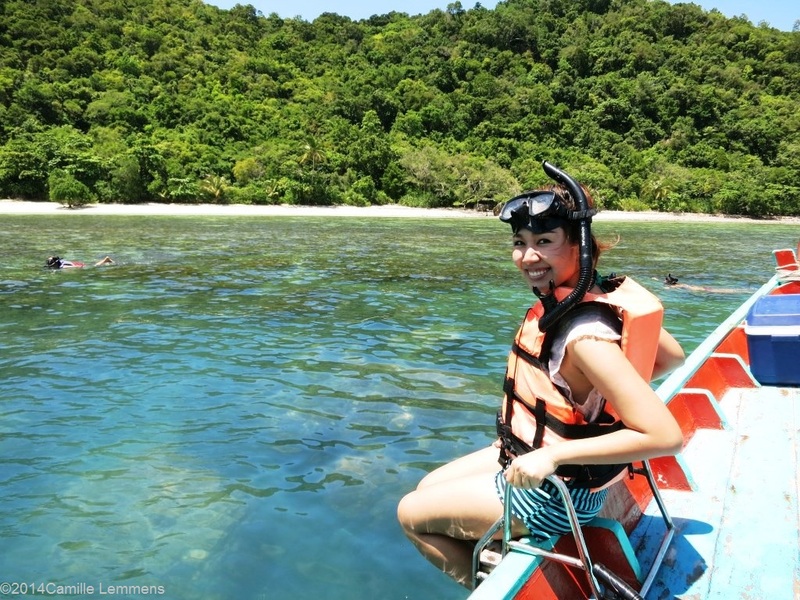 Currently on offer are an Island Gem Gourmet picnic tour which also includes snorkeling, a photographer's tour for scenic and some top locations on Koh Samui to catch some great shots and there's also a drink tasting tour which visits some special places on the island where you can try out local, home made drinks and/or brews. Hope you enjoy the page and visit often. Please ask me if you have any questions or leave feedback! The forecast is looking good for the next ten days, cloudy but sunny moments and possibly a very rare tropical shower. The forecast predicts fairly cloudy skies with possibly an occasional tropical shower until mid next week when the the wind is supposed to pick up again. Today is Her Majesty Queen Sirikit 83rd birthday. Sirikit (สิริกิติ์), born Mom Rajawongse Sirikit Kitiyakara (สิริกิติ์ กิติยากร) on 12 August 1932, is the queen consort of Bhumibol Adulyadej, King (Rama IX) of Thailand. She met Bhumibol in Paris, where her father was the Thai ambassador. They married in 1950, shortly before Bhumibol's coronation. Sirikit was appointed Queen Regent in 1956. Sirikit and Bhumibol have four children, one son and three daughters. As the consort of the king who is the world's longest-reigning head of state, she is also the world's longest-serving consort of a monarch. Sirikit suffered a stroke on 21 July 2012 and has since refrained from public appearances. In Thailand, Her Majesty Queen Sirikit birthday is also celebrated as Mother's Day. These two days coincide in Thailand. The forecast is looking good, hardly any wind, mostly sunny skies and maybe a very isolated tropical shower. Towards the end of this ten day period, there may be some wind coming back up again. The forecast is looking nice for the next ten days, we should have sunny days with occasionally some wind nad a rare shower. It looks like August is about to shape up. The forecast shows the last bits of hard wind today and tomorrow, with some rain possibly today. After that we should have hardly any wind at all and dry and sunny days ahead of us. Just like how August should be. The forecast has drastically changed for the better! The strong wind should be gone by Monday morning and it should be cloudy with plenty of sunny moments and mostly dry. Enjoy this more common August weather and get the sun lotion out! 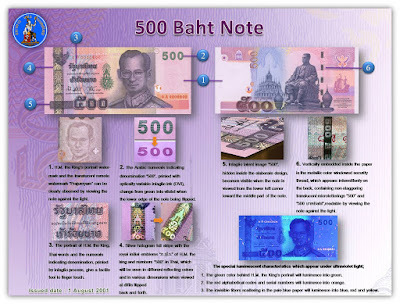 There are currently various reports circulating about counterfeit 500.-THB notes in circulation on Koh Samui. Various banks on Koh Samui are aware of the situation and ask you to be vigilant when accepting payment or change. 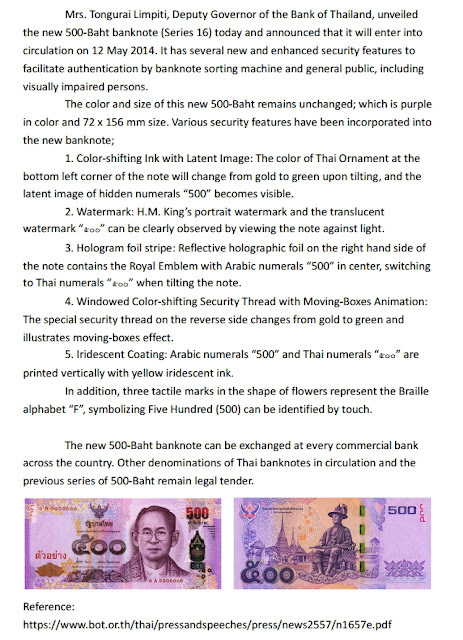 The new 500.-THB note and it's security features, unfortunately there's no description yet of the differences between the original and the counterfeit notes, be vigilant! 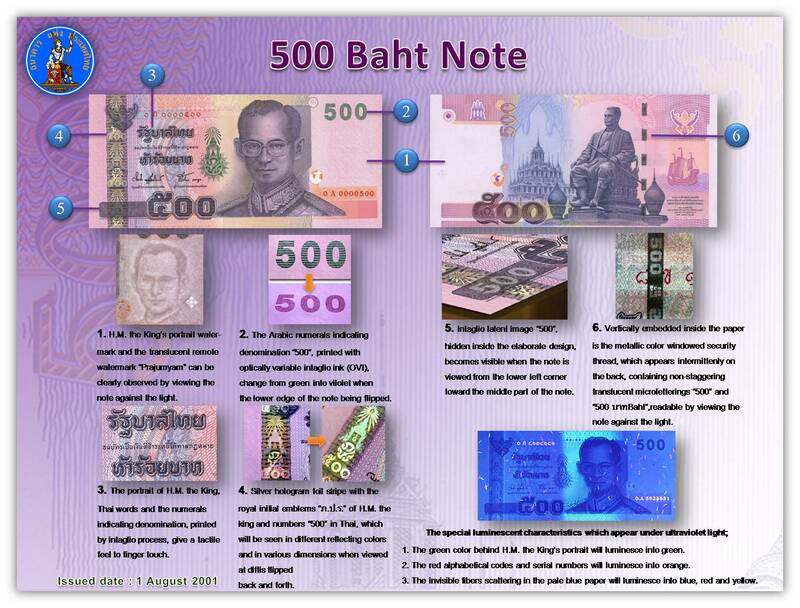 Be careful and vigilant when handling 500.-THB notes, when you receive them or when you still have some yourself. The forecast is easing up a little bit, over the weekend and this Monday we should still have strong winds, but after that we will see the wind on and off and come the weekend after that, the wind should have gone almost completely. Cloud cover is breaking up occasionally and I do expect sunny moments after this coming weekend but with still the occasional tropical shower being a possibility. The forecast predicts very strong wind until next weekend, combined with some sunny days and a some rainy days. There's a weather depression all over Thailand and especially Southern Thailand. Phuket has even worse conditions at the moment with a lot more recent rain. This big lizard crossed the road in Bang Rak yesterday afternoon, in search for the ocean. It jumped over the wall of a nearby resort and took shelter in a corner. I'm not surprised if it has been barbecued last night! The forecast for the next ten days shows lots of strong wind, plenty of cloud cover with occasional sun breaks and possible showers, especially mid next week. Land for rent or lease in Choengmon on tropical island destination Koh Samui in Thailand. It's just over 4 rai and it's located between Choengmon and Chaweng. If interested, you can call my wife or myself, respectively the first or last phone number listed.